Heat grill to medium heat. Cut three large pieces of heavy duty foil. If you don’t have heavy duty foil, use a double layer of regular foil. Thinly slice potatoes and place on one sheet of foil. Drizzle with water and oil. Season with salt and pepper, if desired. Fold foil to make packet. Mince shallot, dice pepper and chop parsley. 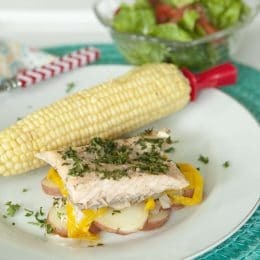 Place salmon on another sheet of foil and top with shallot, pepper and parsley. Season with salt and pepper if desired. Fold to make packet. On the last square of foil, place the husked corn and fold to make packet. Place all the packets on the grill and allow to cook for 15 minutes. Carefully peel open foil to release steam. Potatoes will be done when fork tender and fish will flake apart. Corn may take longer than fish and potatoes, so consider getting on grill first. Serve together with a simple tossed salad of chopped lettuce, chopped tomatoes, and your favorite dressing.